"A .357 magnum is a good weapon, but I've seen 38's bounce off of windshields. No good in a city like this." Here's the third Dirty Harry film in the franchise and, for my money, the best sequel of them all. It�s not quite as contradictory as the second film in the series (specifically Harry's objection to the vigilante killers) and not quite as jokey as the last two. 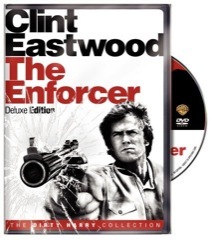 The Enforcer is the point in the franchise when Detective Harry Callahan becomes less of a believable character and more of a caricaturized action hero. This may sound like damning criticism, but it�s not. Sure the series might be boarding on tongue in cheek at this point, but it doesn�t mean it�s any less fun to watch. This time around Inspector Callahan has to contend with a band of insane revolutionaries on the loose in San Francisco who intend to blow it all up if their demands are not met. Things are further complicated by the murder of his current partner and an unlikely alliance with a new recruit, female cop Tyne Daly. It doesn�t take long for Harry to run afoul of his opportunistic captain, Bradford Dillman, who wants him off the case (and the force) for good. As you might have guessed, all of the prototypical elements of the Dirty Harry formula are here in abundance. The good guys are tired and true (and not without attitude) while the bad guys come in all shapes and sizes. From street thugs to bureaucrats, there's no shortage of opposition here. It's no surprise that Harry knows what's happening before anyone else does, but that's what makes The Enforcer so much fun to watch. A lot of obstacles present themselves before Callahan, and watching him plow right through them ensures crowd pleasing fervor. It's interesting to note that we're back to the hippie villains for this third installment. While I'm not comfortable in dismissing any of these films as propaganda for either political party, The Enforcer does take a rightist slant similar to the first film. Here our villains are a band of disillusioned hippies who have lost faith in their government in the wake of Vietnam. Now they're interested only in money and their grand scheme amounts to little more than a grandiose extortion plot. Director James Fargo keeps a tight handle on the action while reeling in the somewhat bloated length of the previous sequel, Magnum Force. The action here is exciting: from an epic foot chase through the streets of San Francisco to a down and dirty brawl in a brothel to the top notch climax set on the island of Alcatraz. The Enforcer may be closer to a popcorn flick than either of its predecessors, but it's never dull. Also keeping things fresh is the presence of Daly as Harry's new partner. The script doesn't give her a tremendous amount to do (and she disappears from the film for such a length that I forgot about her entirely at one point), but Daly works wonders with the material and puts a fresh spin on a tired plot device (the new partner). Her eventual friendship with Callahan is genuine and not without some emotional heft. Once a film becomes a franchise it can be a task unto itself just to keep things from becoming stale (and it�s amazing how quickly that can happen). You can begin seeing the chinks in this canon's armor with The Enforcer, but its filmmakers were smart. They covered it up with a brisk pace, a somewhat outrageous storyline and lots of action. It may not be the bold and daring film that Don Siegel's 1971 original was, but one look at this film and it's easy to see why people couldn't get enough of Dirty Harry: Clint Eastwood is the man. Image Transfer Review: The 2.35:1 anamorphic image is remarkable considering the film's age. I'll admit that I'm becoming spoiled by Blu-Ray in this high definition age of home theater, but I won't take anything away from the image on this disc. Film grain is evident (as it should be), but the transfer is sharp and colorful. You'll get some tiny bits of dirt on the print here and there, but nothing that should prevent you from marveling at Warner's restoration job. I have no idea if this is the same transfer used on the 2001 release, but whatever the case may be, this looks damn good. Audio Transfer Review: Much like the 5.1 surround track on Magnum Force, this is a masterful job for home theater fans. Dialog is crisp and pronounced, but the action scenes are rendered far more rousing than the old theatrical mono mix (I tested the Japanese mono track for comparison purposes). Bass-loaded gunfire and explosions will put you into the action on the streets of San Fran. Like I wrote in my Magnum Force review, some new 5.1 mixes are beyond lackluster, but not here. And best of all, it feels natural. Extras Review: First off is a friendly and enjoyable commentary track by director James Fargo. While he occasionally lapses into bouts of silence, this is an informative track and full of amusing Eastwood anecdotes. Fargo is quick to compliment his production crew and offers a frank analysis of the film thirty plus years later. The Business End: Violence in Cinema (30m:05s): An entertaining look at the seemingly age old argument that cinematic violence breeds real life violence. Participants in this lively documentary are the same culprits featured in the Magnum Force documentary, including Million Dollar Baby writer Paul Haggis, Joel Silver, Joe Carnahan, Tom Fontana and Michael Madsen. It looks like Warner has spread some interesting discussions across the five Dirty Harry releases and I'd honestly recommend all five films for these features alone. While there isn't any new ground broken here and I don't see how the horror genre can be left out of a discussion on cinematic violence, this is still a highly watchable little debate. Harry Callahan/Clint Eastwood: Something Special in Films (06m:00s): An archival making-of featurette of The Enforcer packed with interesting behind the scenes footage of the film. My only complaint is that we don't get to see more of this stuff. We're traveling an oft-traversed road with The Enforcer, there's no denying it. But Clint Eastwood keeps things lively with another lively performance and the supporting players give it some distinction amongst the other films in the series. Those looking for a little rough and tumble action flick will find much to savor with this one. Thirty-two years later and this one has held up remarkably well.